Whenever any tax issues arise, people generally go to tax lawyers to resolve their problem. Tax lawyers are the experts who possess strong knowledge of tax laws and issues such as property, income, and federal tax. Their role usually includes resolving financial or tax law related issues for their clients. 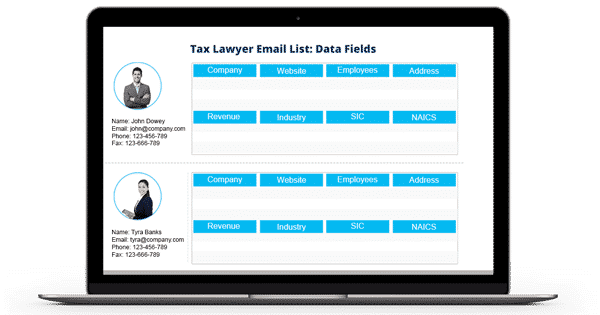 If you are launching any product or service for this market or looking to supply your product for these professionals, then Blue Mail Media can deliver you the high-quality Tax Lawyers Email List that lets you target the right audience quickly. B2B marketers trust Blue Mail Media more than any other marketing list providers do. It is because we provide the data that is of a high standard and most accurate. All the information we offer on our list is 100% tele-verified and email verified. And also, it complies with the guidelines of GDPR and Anti-Spam law. Hence, you can use our email list to execute multi-channel marketing campaigns smoothly with no much effort. Blue Mail Media’s Tax Lawyers Email Database is a one-stop solution for your marketing needs! You can target as well as interact seamlessly with the tax lawyers no matter of location. Our list covers the data of prospects residing in several regions across the globe such as North America, Europe, Australia, New Zealand, Asia, Africa, the Middle East, and South America. Hence, use our list and explore the sales opportunities in almost every part of the world. Besides, the data we offer you is from authentic and internationally trustworthy sources you can rely on. We give you an option to customize the Tax Lawyers Mailing List based on your specific requirements. It includes the location, company size, and revenue; SIC code, NAICS code, and much more. This email list is generated with precision, and you can run direct mail, email, and telemarketing campaign using our database. We have a team who is responsible for maintaining the accurateness and reliability of these data. They perform thousands of verification calls and sends verification emails regularly to keep the Tax Lawyers List free from errors and redundancies. Avail our robust Tax Attorneys Mailing List and get in touch with our experts’ team today to learn more about it. You can either call us by dialing 1-888-494-0588 or send an email to sales@bluemailmedia.com now.